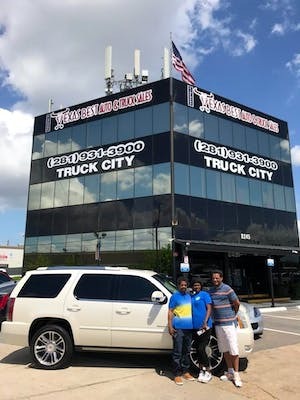 Just bought a really really nice truck from Erick at Finchers Texas Best Auto & Sales on the I-45 location in Houston. Erick gave us exceptional service. I will recommend this place to everyone. The people are friendly and honest no hassles. Stop by and ask for Erick. 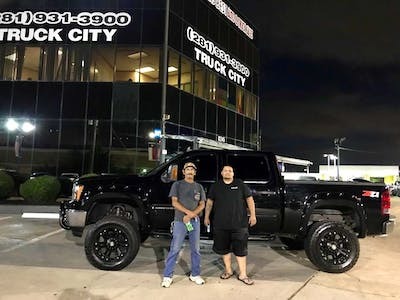 third truck we bought thereand there is a reason why we keep going bk.... the trucks are awesome and u will drive out with something that u will love.... thanks eddie for all u have done for our family!!! I had a wonderful experience at Finchers! We bought a super clean Expedition at a great price and it was a no hassle deal. The dealership was up front on the price and they were very easy and fair on closing the deal. I would recommend this dealership. They were very help and mad sure i got what was good for me. That me and my family was help as needed. I'm glade i decide to come here. 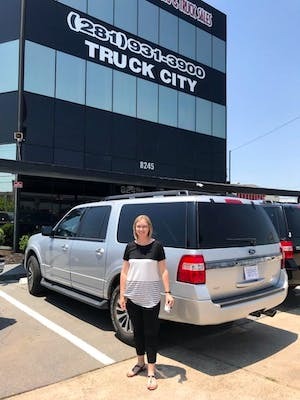 The best place in Texas to buy a vehicle.........all dealerships will give you xxxxxxxx, but finchers sells quality vehicles. Great deals! Nice and friendly staff! Found the sales staff to be very helpful and attentive. They addressed all my concerns. Actually went back and sold them a vehicle. They were fair with their pricing. Will return again in the future. Chris Cherry was extremely kind and did a great job at getting the best deal he could. The team at Fincher's Texas Best went above and beyond to facilitate an exceptional sale. Chris Cherry worked with and for me to see the deal through. Of note, both the sales and finance managers were very proficient. Thank you. I am very pleased with my new truck! I had a great experience at this dealership. Chris Cherry did a great job taking care of me and made the whole process very easy. Everyone is very friendly and also bilingual. Not rushing you and explains the process of purchasing a vehicle. There is a wide selection of vehicles that can fit any budget. Chris Cherry was very helpful through out the entire process, would defiantly recommend to anyone! Chris Cherry helped us out. Super helpful and found just what we were looking for! Chris cherry was very helpful and great to work with. And Phyllis was a great help answering on the weekend. Chris Cherry was great in helping us buy our vehicle. He got back with us quickly with our question, and hit us out the door with the price we wanted. The environment is so welcoming, and they really listen to what the buyer wants. Carlos was super kind and was great at helping me find my first car!!! Excellent- no doubt about it!!! Marc Martinez very helpfully guy. Awesome purchase. Get great deals i recommended. Chris Cherry did a great job highly recommend finchers texas best in Tomball. Chris Cherry did a great job I would highly recommend going to see him at Finchers Texas Best Tomball. Chris Cherry did a great job and it was a great deal thanks. My husband & I went here looking for a truck. Our salesman Chris Cherry was awesome! He went above and beyond to make sure that we got what we needed within our price range. We actually left with something better than we intended and still within our range. They are very friendly & will work to get you what you want. Purchased a very nice Toyota Tundra from Fincher's. Chris Cherry definitely went the extra mile to make sure I got the deal I was looking for. I would highly recommend checking them out if you are in the market for a vehicle. My sales rep. Carlos was very helpful, polite and very patient. Helped me find the car i wanted at the best price. I even got the best cash value for my trade in. Overall I am pleased with everything and i recommend this dealership to everyone. Everyone at this location was wonderful! Chris C. went above and beyond to help us find the vehicle we've always wanted. He was patient, kind, and extremely helpful through the whole process. Chris did a great job. I highly recommend Finchers Texas Best in Tomball. Had a great painless buying experience with Jesse and the sales manager Mike. All inventory is in great shape and Jesse is knowledgeable with all the inventory and answered all my question. I will definitely be back for my next purchase. Chris Cherry did a great job. I highly reccomend Fincher Texas Best in Tomball. Excellent Service and Best Dealership to find the vehicle that you need. I Definitely Recommend it, Michael Pavone and his team are the BEST. Here at Finchers Texas Best have bought my wife '12 Chevy Silverado four years ago, and now we're back to trading in my '06 dodge for a '16 Dodge Ram Cummings. 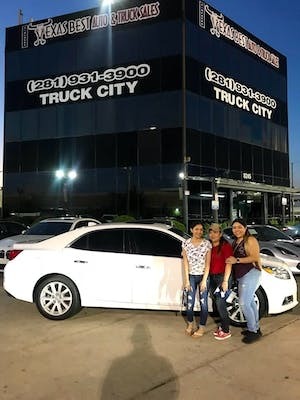 Will be back for our next vehicle, best customer service with Carlos Herrera very helpful completely recommend. Carlos Herrera was very professional and took care of us. This is the second vehicle we have purchased through Texas Best and very pleased both times. They had us in and out with no haggling. Everyone was very friendly. Will be a continued customer. The guys here did a really good job at giving me all the information I needed for the car I was thinking about purchasing. I felt very comfortable, not pressured to buy. Great service. Great deals. My husband & I missed out on ours but they sell good vehicles nonetheless. Mark and micheal did a great job. The dealer seemed a little understaffed but they had me in the truck I wanted and out the door in probably 2 hours. Price was as listed on website, no games.